Some time ago when Sifu Anthony Korahais mentioned that he would use his Tiger-Claw to counter opponents trying to pin him down, some people laughed in their ignorance. In this video series, you do not even need the five fingers of your Tiger-Claws but just one finger of your One-Finger Zen to counter any attempt to pin you onto the ground! This secret was first revealed by Sifu Kai Uwe Jettkandt of Shaolin Wahnam Germany. A few other secrets are hidden in the open. See if you can find them. Sifu Roland repeats the feat so that others may catch the secret. Do you know what it is? A clue is that you have to be relaxed. If you tense your muscles, you may not succeed in escaping from this Lazy Man Smoking his Pipe. The counter pattern is called “Carp Turns Body”. Here is another chance for you to find the secret. Here is another clue: as suggested earlier, even if you know the technique you may not escape this lock if you miss the secret. By now Shaolin Wahnam members should be able to know what the secret is. It is also interesting to note that, as characteristic of monkeys, Sifu Roland does not forget to reward himself with a peach as he breaks the lock. If you still have not found the secret, which can be applied not just to this situation but to other situations as well, this video clip gives you the answer, but you still have to find out what it is yourself. Nevertheless, even if you know the answer, you may still be unable to unlock yourself from the Lazy Man if you lack the skills. Peter knows the secret. So when Sifu Roland attempts to break the lock again, Peter subtly neutralizes Sifu Roland's moves. But even that, Sifu Roland succeeds in breaking the formidable lock, albeit with more effort. The pattern Sifu Roland uses to subdue Peter after breaking the lock is known as “Old Man Pushing a Cart”. If you have missed the secret of the Pipe Smoking lock, don't despair! Here, Grandmaster Wong shares another great secret using One-Finger Zen which can be applied to any locks or combat situations! Of course, you must have the internal force derived from One-Finger Zen to enable the secret work. This secret was first revealed by Sifu Kai Uwe Jettkandt of Shaolin Wahnam Germany. Sifu Roland is powerful and has held Sifu Eugene firmly. Yet with a seemingly gentle movement of just a finger, Sifu Eugene can make a gorilla roar and release his hold. Those who have no experience of chi flow are warned not to attempt this counter, as it may cause serious but insidious harm to the attacker. Sifu Eugene and Sifu Roland demonstrate the application of One-Finger Zen again. Sifu Roland rolls away to avoid the serious harmful effect of the One-Finger Zen counter. 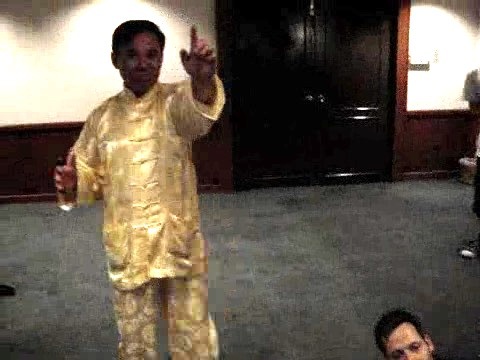 Some incredible secrets are revealed by Grandmaster Wong. An Incredible Technique of One-Finger Shooting Zen from Wong Kiew Kit on Vimeo.